This warning light illuminates if the engine start/stop button is changed to the ON position and goes off in approximately 3 seconds if the system is operation normally. 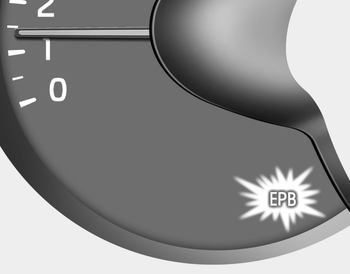 If the EPB malfunction indicator remains on, comes on while driving, or does not come on when the ignition switch or the engine start/stop button is changed to the ON position, this indicates that the EPB may have malfunctioned. The EPB malfunction indicator may illuminate when the ESC indicator comes on to indicate that the ESC is not working properly, but it does not indicate a malfunction of the EPB. The EPB warning light may illuminate if the EPB switch operates abnormally. Shut the engine off and turn it on again after a few minutes. The warning light will go off and the EPB switch will operate normally. However, if the EPB warning light is still on, we recommend that the system be checked by an authorized Kia dealer. If the parking brake warning light does not illuminate or blinks even though the EPB switch was pulled up, the EPB is not applied. If the parking brake warning light blinks when the EPB warning light is on, press the switch, then pull it up. Once more press it back to its original position and pull it back up. If the EPB warning does not go off, we recommend that the system be checked by an authorized Kia dealer.